CANADA – On February 1, 2016, Lutheran Church–Canada (LCC) released a church-wide survey, asking all members of LCC—lay, clergy, and deacons—for their input on the restructuring of our church. “The structure that emerges from your responses will lay the groundwork for how we will do national and international missions and ministry for many decades, and perhaps even generations, to come,” he continues. The Commission is anticipating at least 2,000 responses to the survey in order for the results to reflect the perceptions of the whole church. 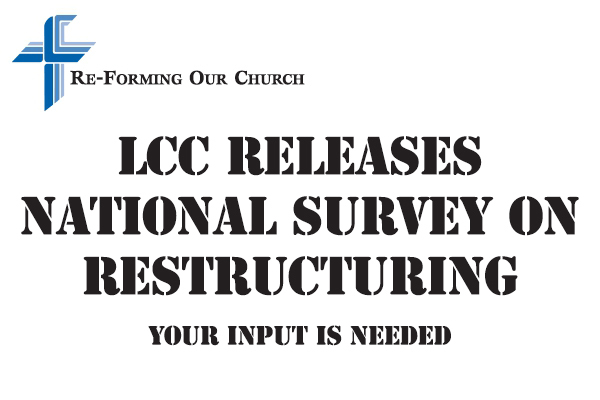 The summary of all the responses together will all comments will be made available to every member of every LCC congregation together with an analysis of the data by the restructuring consultant. The survey, which is restricted to LCC members only, can be completed either online or in print and is completely anonymous. You can obtain a paper copy of the National Survey from your pastor, congregational chairman, or secretary. The same people can provide you with a web-address and password to complete the survey online. The online version of the LCC National Survey will close at midnight February 29, 2016. The complete results, comments, tables, graphs, and analysis of the survey will be made available to all LCC members before the end of March 2016. You can read collected information on the Restructuring Process at www.canadianlutheran.ca/lcc-restructuring-process/.